Joe Black is located on Portage Avenue, across for the foot path to Assiniboine Park, I imagine this keeps them extremely busy on warm evenings and weekends. To my knowledge, the storefront has been a cafe for over a decade. Joe Black itself only opened a few years ago. The food, decor and atmosphere similar to Daily Grind. They offer a large variety of food, including ice cream (or something ice cream like) and hot meals. In my introduction to this series, I promised to note any exceptions to food or coffee quality. Joe Black is one of these exceptions. The coffee definitely sub-par. Noise/Ambiance: Fine. Though, I’d expect most evenings to be far too busy to work. Mathematically, 3 “fines”, 2 “poors” should equal a “fine.” But I really didn’t like this place as an office. That said, as a place for an icy beverage after a day at the park I’m sure it’s excellent. Starbucks in the Polo Park Chapters was the first Starbucks to appear in Winnipeg (around 1999 according to my wife). It opened alongside a Baked Expectations storefront which served their (amazing) desserts and pastries. In the years since, the Baked Expectations shut down and eventually – once it was clear that no tenant could be found – the service counter and equipment were removed and the space was converted into more seating for Starbucks. This created the largest Starbucks I’ve ever been to, I wouldn’t be surprised if this is the largest Starbucks in the World (by square footage). This location has a number of unique features that make it pretty ideal for the laptop worker. When the restaurant was removed, they left the electrical plugs originally intended for countertop equipment in place. So you’ve got an entire wall of plugs available to you in that area, more than enough for the seating. At some point in the past the area also contained an Internet Café (a link for the youngins). The computers have long since disappeared, but they’ve left the six desks intact, complete with ample electrical outlets. As if that wasn’t enough, I also noticed a publicly accessible plugin on a pillar near the bar. The location is a little out of the way, because of this it doesn’t get a lot of foot traffic. Which is not to say it’s not busy. It would seem that I’m not the only one who’s discovered this hidden gem. The tables and desks are usually jam packed with laptops. There have been a few times when I’ve arrived after 1pm and not been able to find a table. The seating consists of the standard wooden chairs, with small round tables. The 3 former internet surfing desks are quite large, designed for 2 chairs – and when it’s busy both chairs are usually occupied. There are a number of comfy-looking armchairs around the fireplace (yes it even has a fireplace!). The WiFi is provided by Bell, like most Starbucks across the country. It’s free after you agree to a TOS screen. It’s reliable, but tends to slow down quite a bit when it starts to fill up. I think the number of laptop connections is probably a little outside the design specs of these systems Bell rolls out. A couple of other minor things. It only opens at 9am, if you’re an early riser this might not work for you. There’s essentially no public transit access and the walk from Polo Park Shopping Centre is farther than it looks. Busyness: Great. Little foot traffic, but show up early to get a table. Historical sidebar: The official name of this location is “Velodrome Chapters”. Turns out the Chapters was built on the site of the Veldrodome used in the 1967 Pam-Am Game. 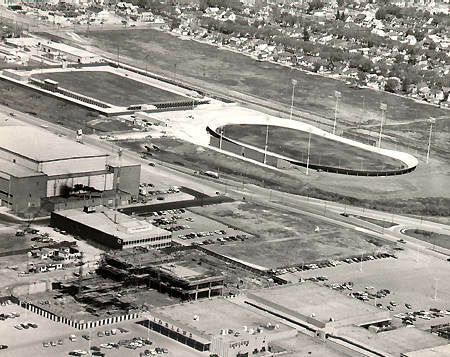 Who knew Winnipeg once had a velodrome. The Daily Grind is the west-most coffee shop in the city, located in a strip mall between a Subway and a Liquor Mart. It’s also the closest coffee shop to home for me, so this is where I’ve been spending most of my time. I thought it would make a fitting first review. Remember the 90s, when coffee shops were springing up on every street corner of the suburbs, every one trying to be more like The Central Perk than the last? With names like Java Junction, Java Jungle, Java the Hut, hire-my-friends-and-never-pay-them. Well, the Daily Grind is the last of that dying breed (TIL even the original is closed). They offer the craziest selection of food and drink: specially coffees, milkshakes, full lunches (which smell really good! ), pastries, gellato and a couple dozen other things I have probably missed. The Daily Grind is a large space, a little bigger than most Starbucks. During a week day, you’ll typically find this place fairly empty and quiet, there have been afternoons when I’ve been the only customer in the restaurant. It seems to be mostly occupied by senior citizens and the occasional college kid working on a paper. I’ve only seen one or two “professionals.” The chairs are well padded and there are a number of tables of varying sizes. There are a fair number of outlets along the wall attached to the Subway (none on the other side as far as I can tell). WiFi is password protected, reasonably fast and fairly reliable – I’ve had it drop out a few times. The store is usually manned by someone who seems to be the owner and one or two support staff. I take it the restaurant doesn’t see a lot of rush traffic, as every time more than 2 or 3 customers arrive, the service grinds to a halt. OK. Let’s get down to the first rating. Busyness: Great! No one’s every there, really, these guys could use your business. Seating: Great! The most comfortable chairs I’ve seen at a coffee shop so far. If you live around this part of town, give it a shot. Since abruptly losing my job a month ago, I’ve been doing freelance work full time (p.s. hire me). I don’t presently have a dedicated office space at home, so I’ve been working at coffee shops 3 or 4 days per week. Sometimes visiting 2 per day. Today on Twitter, I came up with the idea to rate the “laptop worker friendliness” of the places I’ve been visiting. To some degree this is the type of thing that could theoretically be covered by a site like Yelp!. But, I think there’s value in specifically targeting a review at free-loading telecommuters. If there’s an app or site that’s already doing a good job of this, please let me know in the comments. I asked a few people for suggestions on what aspects to rate, I think I’ve come up with a good set of criteria. I’ll be using a 3 point scale (borrowed from Underconsideration’s “Brand New” blog): bad, fine and great. Busy-ness: How easy is it to find a table. Are there a lot of consumers to distract you. Seating: My number one difficulty in working at a coffee shop has been the quality of seating. For the most part, I think the seating is chosen to discourage extended stays. I will not be taking couches or armchairs into consideration, as I am unable to work in that position. Noise/Ambiance: Pretty straightforward. Is it noisy? Is the atmosphere conducive to focusing. Do you feel out of place working on a laptop? Staff Friendliness: Do they shoot you a dirty look if you stick around for more for an hour. Power Outlets: The number of outlets, are they easy to get to, are the located in weird places. WiFi: Do you need an account with a service (if so which), signal strength, speed, reliability. My reviews will be focused around these factors and I’ll combine them somehow to form a overall recommendation. I chose not to cover coffee or food. For the most part, I’ve found the coffee to be fairly equivalent across the board and honestly, I haven’t been eating at these places. Obviously, I’ll note any exceptions. Over this past month I’ve been sticking close to home (Heritage Park, in St James) and been going to a lot of Starbucks. But if I keep this up, I’d like to venture out specifically for the blog.